Elastic resistance bands versus Nautilus machine resistance: Which is better? 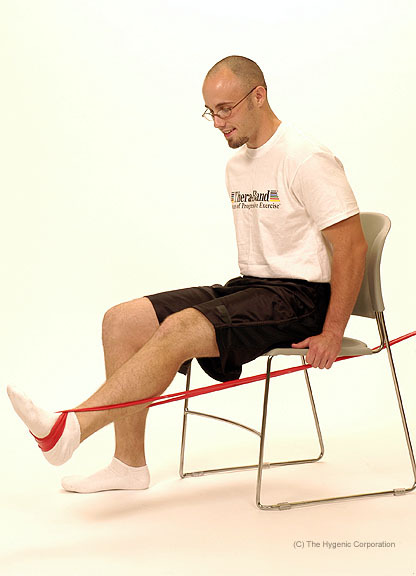 Elastic resistance is a versatile and widely used tool to increase strength. While elastic bands and tubing are prevalent in rehabilitation and fitness, some have speculated that elastic resistance may not provide an adequate stimulus for athletes. Researchers at the University of Malaysia compared the muscle activation and force output of the quadriceps muscle in 16 healthy subjects. They performed a knee extension exercise against an 8 RM (high intensity) resistance using a Nautilus machine and against Thera-Band® elastic tubing. The tubing was tested both in the original length (equal to the length of the lower leg) and at a length that was 30% shorter. The researchers used different combinations of Thera-Band colored tubing to achieve an 8RM resistance. The researchers found that the 30% shorter elastic tubing produced the same levels of muscle activation during mid-range of motion compared to the Nautilus machine. It also appeared that elastic resistance elicits higher levels of muscle activation at lower levels of applied force. The Nautilus machine exercise produced significantly more activation of the quadriceps during the beginning and end of the exercise, however. Other researchers (Colado & Triplett 2008; Rogers et al. 2010) have shown that Thera-Band-resisted exercise programs produce strength gains similar to expensive weight machines. Electromyography (EMG) studies have confirmed that Thera-Band elastic resistance produces similar EMG levels to isotonic free weights (Andersen et al. 2010) and pulley systems (Nelson et al. 2003). In addition, a recent study suggested that elastic resistance should be favored over isotonic resistance because of the higher level of neuromuscular activation particularly during the eccentric phase of the exercise (Melchiorri and Rainddi, 2011), making it useful for rehabilitation. The authors concluded that elastic resistance “can be suggested as an affordable and non-gym based exercise device which has the capacity to provide an appropriate high resistance stimulus to meet the training requirement of athletes.” Therefore, elastic resistance provides a cost effective and clinically effective strength training modality in both rehabilitation and fitness. Previous post: Which is better for shoulder diagonals: Thera-Band or Dumbbells?